Oh yeah…Pocky. As of this entry I’ve reviewed 38 Pocky(s) and there are probably that many more out there that I haven’t yet reviewed as well as that many more that have come and gone which I didn’t get to reviewing. Not mention the Pocky-a-likes (Pepero, Fran, Toppo)…one could do a whole blog on this subject alone and be able to update it regularly. I’m even finding Pocky at my local non-Asian giant food mart so I guess it’s become the ubiquitous Asian candy snack. In case you were curious, cranberry, blueberry and strawberry (as well as some of the ‘artificial flavor’ I’m sure) seem to be the mixed berries in question. Blueberry and strawberry seem the no brainer berries but cranberry is an odd duck. Not a bad duck, you just usually don’t see it as a berry mix component in the states. I’ve seen more loganberries in mixed fruit offerings than I have cranberries and I’m not even sure what a loganberry is. 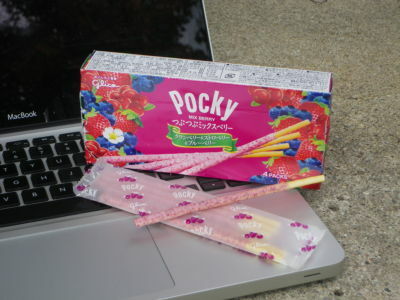 As far as flavoring, I’m really liking this fruity Pocky. It has a wonderful berry smell which is a nice mix of strawberry and blueberry. I hadn’t looked at the ingredients the first time I tried these so I assumed the tartness was from the strawberry but now that I know about the cranberry I’m pretty sure strawberry is just strawberry. Oddly, the blueberry is the most prevalent flavor in the berry mix, followed by the cranberry tart and finished off with a mellow sweet strawberry. I’m used to strawberry taking the flavor reigns and running but this time? Not so much. I’m not even going to complain about the thinner than normal coating because the flavor is berry delicious. Heh. 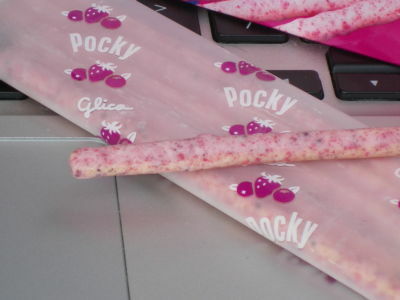 Of course it all comes with the delightful Pocky cookie stick crunch and packaged in 4 handy pretty frosted packages (in one berryrific box) which only adds to the charm. I super-mega-loved these myself. 🙂 I bought a box of them and nommed them before I even went shopping for stuffs for you.